LAHORE: (Friday, July 6, 2018): Punjab University Vice Chancellor Prof Niaz Ahmed has said that behavior and values of any individual person must be given importance and must not be ignored. 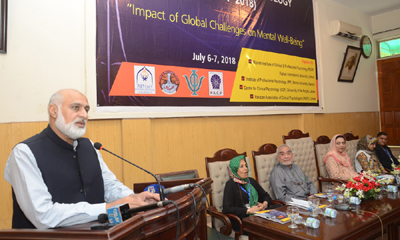 He was addressing the inaugural session of national conference on “Impact of Global Challenges on Mental Wellbeing” at Al Raazi Hall here on Friday. 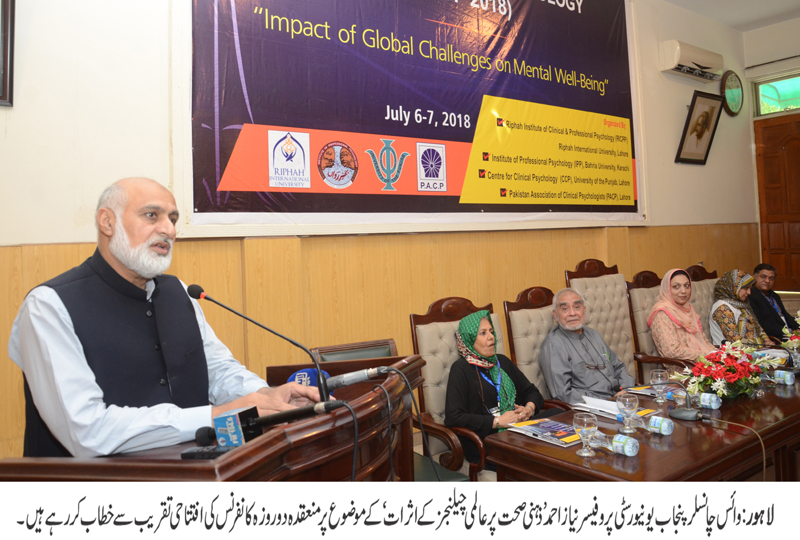 The two-day conference was jointly organized by PU Centre for Clinical Psychology (CCP), Riphah International University, Bahria University, Karachi and Pakistan Association of Clinical Psychologists (PACP). Riphah International University Vice Chancellor Prof Dr Anees Ahmed, Bahria University’s Dean & Director Institute of Professional Psychology Prof Dr Zainab Zadeh, PU CCP Director Dr Saima Dawood, PACP Vice President Dr Nashi Khan, faculty members and a large number of students were present on the occasion. Addressing the conference, Prof Niaz Ahmed said that social sciences were also connected with the field of engineering where we found out various engineering solutions of societal problems according to human needs. He said that the universities must contribute to the betterment of the society and improving living standards of the people. He said that PU was making efforts to resolve psychological issues being faced by the people and was providing various services on campus in this regard. He said that the conference would provide an opportunity of immediate sharing of knowledge and experiences among the scientists and students. In his address, Dr Anees Ahmed said that there was need to find out what were we doing and what were we supposed to do. He said that we should also take care of the intellectual health and we should think that whether we enjoyed intellectual freedom? He said that unfortunately we think in the way we had been directed to think by our slavers. He said that we should solve indigenous problems with local solutions and we should learn the art of managing stress, anger depression etc in our own way. Dr Saima Dawood said that the conference was aimed at providing professional training to the professionals and trainees to deal with mental health issues. The conference will continue on Saturday at Riphah International University, Lahore. Eminent professionals and students from the field of mental health from all over the Pakistan are presenting around 125 empirical research papers in 18 scientific sessions.